Standard - $69.99 Only 6 left! Your best friend invites you to a Halloween party. “Funny costumes only!” she instructs. But you’re on your bluetooth driving through a bad cell spot. “Bunny costumes only” is what you hear. And you have just the outfit for the occasion. Oops. But have no fear! This Adult Bunny Costume can be cute or funny, depending on how you choose to wear it. Besides, some of those overtly “funny” costumes are overdone anyway; you can make this fresh, original, and memorable! Create a humorous story for your bunny--maybe you’re a disgruntled rabbit who’s sick of being pulled out of a magician’s hat, so you’re on a cross-country road trip to “find yourself”--or play up the clown-like vest and tie of this costume and opt for slapstick comedy all night long. The point is that a classic bunny costume is welcome anywhere--even Easter parties--and you can make it as sweet or sassy as you like! The furry white jumpsuit has an attached bunny tail, matching white mittens and white spats. Pull up the hood with its pink-lined bunny ears and prepare to laugh your way through the night. 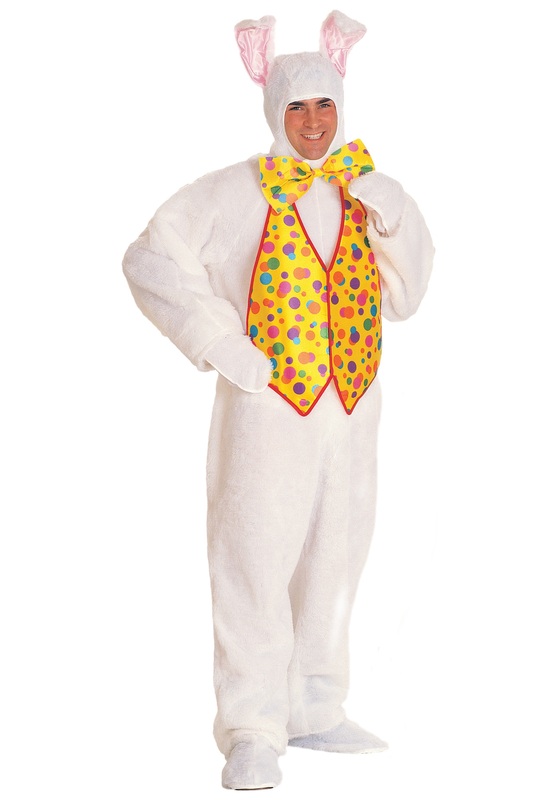 And if any of your friends give you flack about misunderstanding the costume theme, practice your funny bunny puns and ask him, “How would you like it if a drop you like a bad rabbit?” You can sling jokes, puns, and zingers all night in this festive and fun outfit!